A few months ago a zombie outbreak hit. Dad piled us in the car and we fled our Chicago suburb - it was L.A. or bust! It sure was an unforgettable trip, with danger lurking around every turn. I made a game to remember the experience, using whatever pieces I could scrounge up... The same game you're holding now. Good luck making it to the coast! 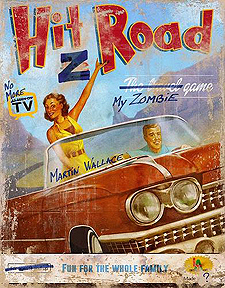 Flee the zombie invasion and try to reach the west coast alive. Compete with other players to choose the best path each turn, while managing your resources - ammo, adrenaline and gas - to overcome the perils tht lie ahead. The player who makes it to L.A. with the most points wins!